HOUSTON – This was 31 years ago Friday to the day. A young basketball coach named Jay Wright was at the University of Rochester, and making extra money as the assistant director of intramurals. So it was his job that Monday night to set up the field hockey games. One problem. Georgetown was playing Villanova in Lexington for the 1985 national title. “The guys who played floor hockey really didn't care about the national championship game,” Wright was saying Friday. “I went to the women's soccer coach's house -- I was single then, I was living in Rochester by myself -- I sat on his floor and watched that game. Thirty-one years ago Friday, Villanova put an April Fool’s joke on Patrick Ewing and mighty Georgetown by hitting 78.6 percent and missing one shot the entire second half. It was a 66-64 upset that will stand for the ages. Thirty-one years later, there are murals on the wall at Villanova, a trophy in the case, a banner hanging from the ceiling, and an aura still in the air. The national champions of 1985 are never far away. To the average college student – and the average college basketball player – history is last week. Three decades? Might as well be talking about Aristotle. But not at Villanova. Not to these Final Four Wildcats. To be sure, 1985 is long time ago. What can it mean to a 20-year-old? The coach wonders. “The '85 team is around all the time. Coach (Rollie) Massimino is around all the time,” said Wright, who works very hard to keep all the past Wildcats in the family. The Wildcats' last trip to the Final Four was in 2009. Wright had gone to Lexington that year to attend the coaches’ convention, and his first Final Four. “It was overwhelming,” he said, “just to see all the big-time coaches.” But he had to return to Rochester Monday. Field hockey was calling. Still, he had to follow the game, even if it meant sitting on the floor of someone’s house. Perhaps it is not quite so vivid to some of his players. Hart said he has never watched a tape of the 1985 game, but he is a minority in the Villanova locker room. Georgetown shot 54.7 percent that night, committed only 11 turnovers compared to Villanova’s 17 – and lost. Those Wildcats had to deal with Ewing and the Hoya defense, most intimidating in the nation. These Wildcats have to deal with Buddy Hield, whom nobody has been able to stop. That Villanova team had lost twice to Georgetown during the season. 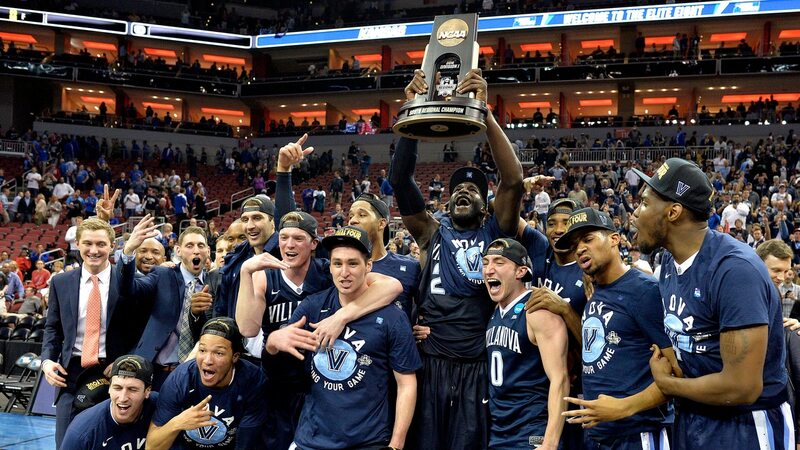 This Villanova team was trounced by Oklahoma in December. Sound like an echo? These Wildcats wouldn’t mind. “It was the perfect game,” Reynolds said of 1985. “It’s funny, in our program we have four things that we really pride ourselves on. Defend, rebound, run, execute. That game was the perfect example of execution. It’s everything this school is about. It’s tradition, it’s not forgetting where we came from. To think, his coach might have seen it in person. Blame field hockey.